This is normally the time that I'd do a year-in-review but I've only managed to publish two patterns this year (Babadook and Blacula). That being said, I did get a lot of knitting finished. Part of that is because I was out of work for 6 months rehabbing my knee, and part was that I finally finished school this year. I have a lot more time to knit and cook now. I have already made plans to knit several socks in 2016, and joined Yarn Yenta's Knit From Stash 2016 KAL. I don't have the patterns in advance but I did pull out 12 skeins of yarn and put them into bags labeled with the month. 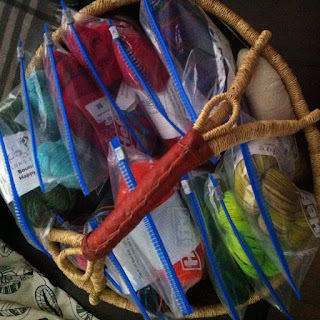 I once read a blog where the Yarn Harlot discussed putting 12 skeins of sock yarn and 12 random patterns into bags, and putting those bags into a cupboard, and grabbing one a month to knit. I've always been intrigued by that idea, and so I'm getting as close to that as I can. In thumb news, I discovered that I can indeed knit, but more slowly than usual. I'll take it.